Overlooking the Adriatic sea, Hotel Boemia Riccione is only fifteen minute drive from the Federico Fellini Airport. Boemia Hotel provides an ideal base to explore the near by Misano World Circuit Marco Simoncelli and Cattolica Airfield, as well as everything the local area has to offer. It is also just twenty minutes’ walk from the Riccione Train Station, and provides convenient access in and around the Riccione region. The rooms at the Hotel are bright and airy and come with flat-screen TVs and minibars. Complimentary slippers and bathrobes are provided in the bathrooms as well as hair dryers. If you need to keep in touch with family and friends back home there is a fast WiFi internet available throughout the hotel. Logging details are provided at reception. 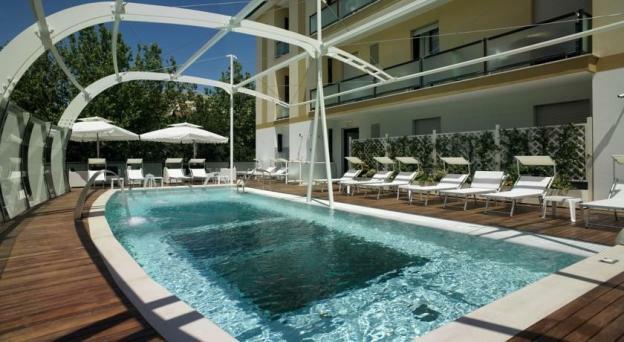 Hotel Boemia Riccione is family friendly, with several rooms especially designed for family holidays in mind. A delicious breakfast is available each morning at Boemia hotel, also there are a number of cafés and eateries nearby if wish to taste the local cuisine. The hotel also features a day spa with Jacuzzi, a steam bath and a sauna. It also provides a free shuttle bus service and free bicycle for the hotel guests. Hotel Boemia, is in a great location, just with 2 minutes’ walk you’re at sea and within less than 5 minutes you are in Ceccarini street which is the focal point of the town with numerous cafes, bars and clubs, shops as well as hotels. The republic of San Marino was founded in 301 A.D. and is the most ancient European republic. Situated in the centre of Italy, around 15 km from the Romagna riviera, the republic is located around 700 meters above sea level on Mount Titano, a prominence which gives the first hint of the presence of the Central Apennine Mountains. Situated at 142 metres above sea level, with the republic of San Marino, Rimini and Carpegna in the background, Gradara represents an extraordinary urban and architectural synthesis. Legend has it that the castle was the scene of the famous and tragic love story of Paolo and Francesca. They were caught in each others arms and killed by Gianciotto, Francesca’s husband. This love story was immortalized by Dante in his Divine Comedy. The original capital of the Duchy of Montefeltro (35 km from Pesaro) extends across the top of two hills. Its houses and churches are built on the sides of the hills as far Porta Lavagine on the north-east slope and Porta Valbona to the south-west. This is one of the major art towns in the world, because of its history and for the many architectural buildings and works of art which are housed in Urbino. It is also the birthplace of the famous Italian painter Raphael Sanzio. 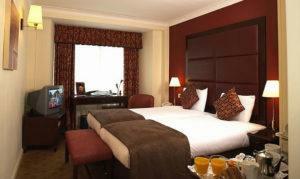 Essex is a lovely part of England and there are some fantastic hotels on offer. At times though, it is not always easy to find hotels that are child-friendly and family-friendly, but with a little bit of searching, you’ll be surprised at what is available. So for those of you visiting Essex and don’t have hours to trawl through hotel listings to find child friendly establishments, here are 4 great hotels that are child friendly. Some folks like to think that where you lay your head at night is just a convenient place to sleep. But my experiences in trips to places like Florida have taught me something different. The Americans have created some very interesting places to stay that are different from what you might normally expect to find, all with the quality that you know you are likely to experience. The thought of staying in accommodation that was below the sea, would present a challenge to some people – but in Florida such a hotel exists. 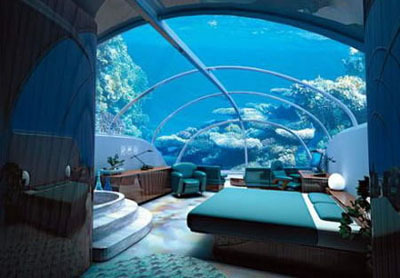 Architects in the USA have made the dream a reality with the conversion of several underwater complexes into viable luxury accommodation. The Jules’ Undersea Lodge – named after Jules Verne (author of 20,000 Leagues under the Sea) is situated in Key Largo in Florida, and is normally part of an all inclusive Florida holidays package.